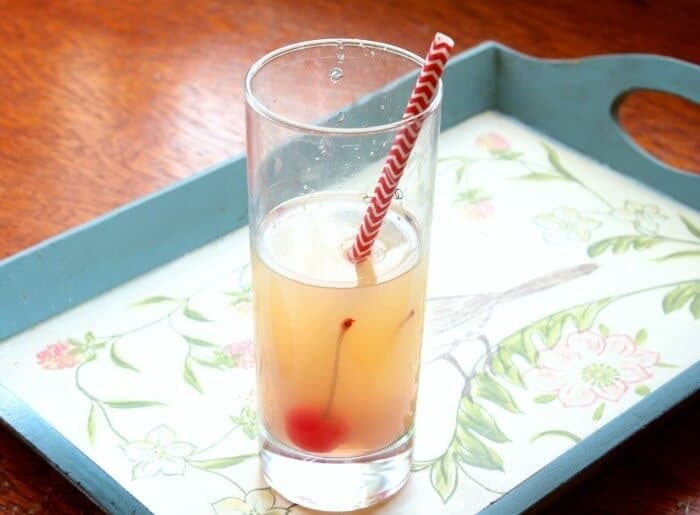 A classic Whiskey Sour recipe is one that everyone should have in their repertoire. Sweet, tangy, and refreshing… it’s been a favorite cocktail for decades — and with good reason. It’s absolutely delicious. 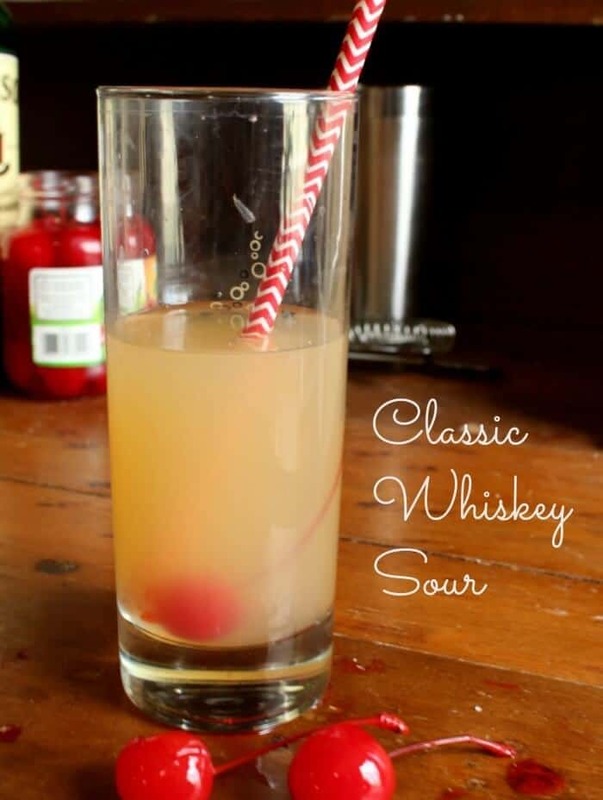 The first mention of the Whiskey Sour is in Wisconsin in 1862. It was published in Jerry Thomas’ How to Mix Drinks, or the Bon Vivant’s Companion then later in The Bar-Tenders Guide. There is some belief that the cocktail was around far longer — perhaps from the 1700s. (Hat tip to Drink Straight Up blog.) It’s super simple and honestly there is something about serving guest a perfectly mixed Whiskey Sour that makes me feel elegant. I grew up in the 1960s and it was the Age of Cocktail parties. My parents entertained quite a lot between Saturday night card parties and entertaining business associates. Then there were the Christmas parties, New Years parties, Fourth of July parties — you get the idea. Each party had miles of appetizers made by my mother and gallons of classic cocktails mixed by my father. Dean Martin and Perry Como crooned in the background and everyone dressed up — the men in suits and ties and the women in poufy dresses. I would sit on the stairs, long past my bedtime, and watch it all as long as my mom didn’t look up and give me the look. Once that happened I had better be in bed… or else. I’d imagine how my parties would be, when I was grown up, and how I would sweep through the room looking as beautiful as my mom. Well, the 70s hit and by the time I was an adult in the 80s entertaining had taken a more casual turn. It was more likely to be jeans, tank tops, and grilled steaks with a few friends — maybe a glass of wine or a bottle of beer. Classic cocktails? Those were so last decade! Sadly, I had learned how to make a Whiskey Sour, a perfect whiskey sour, for nothing. I think we’ve lost a lot. Not just the cocktails but a graciousness, an elegance, and a desire to be socially correct rather than politically correct. It was a time of thank you notes, engraved invitations, and classic cocktails. I liked it. So, I my reminiscence led to the idea of using Saturday blog posts to just post a quick classic cocktail recipe. Maybe not all year but at least for the month of January. Maybe next month, who knows? So, first things first. A Classic Whiskey Sour recipe is the perfect blend of sweet, sour, and that alcohol bite. If you’ve only ever had one made with sour mix, that commercial chemical bomb you can find in the booze aisle? Ick. Do not use that even if you are desperate. First of all, if you are going to make classic cocktails make some simple syrup. It’s easy – just bring two parts of sugar and one part water to a boil and turn off the heat. Make sure the sugar is completely dissolved — if it isn’t cook it a little longer. It will keep up to a month in the fridge so you can have it on hand. Pour the Whiskey Sour in an on the rocks glass and drop in a Maraschino cherry or two to serve. For a variation you can shake the Whiskey Sour with a teaspoon or so of egg white before pouring it over ice. It makes the drink creamier and frothy — some people like it. I perfer mine the way God intended — no egg whites. Whatever you do, if you are using egg white do NOT shake it with the ice. You’ll have pieces of frozen egg white floating around and that isn’t elegant at all! If you get tired of your cocktails getting watered down by the ice you’ll love these stainless steel cubes! They chill you drinks without diluting it and I think they look better in cocktails than the black stones. Tangy, sweet, and soooo good, the Whiskey Sour is a classic American cocktail that deserves to make a comeback. It's super easy, elegant, and delcious. 2:1 sugar to water boiled until the sugar dissolves. LOVE your recipes, especially the Honey Buttermilk recipe-OMGosh. Always turns out beautiful will be making the whiskey sour for cocktails today. Thanks! hope you like it!! Looks like the perfect winter drink for me! I love a classic whiskey sour. On my other blog, Grey is the New Black, I post a cocktail once a week. It’s an excuse to make cocktails! Whiskey Sour was the first “grown up” cocktail I ever ordered for myself at a bar. Thanks for the reminder of how much I love this drink! 🙂 It really is so good. 🙂 It’s making a comeback at my house for sure!